Diabesity is a growing public health threat. It directly impacts more than 1 billion people globally, including 50% of Americans over the age of 65. Health officials and other experts have been searching for years for recipes that end this epidemic. They have had no success. Despite their best efforts, the numbers of those developing diabesity keep growing. Diabesity is a condition encompassing two diseases — obesity and type 2 diabetes — that occur together. The association between obesity and type 2 diabetes can clearly be seen in their similar growth rates. After all, adult obesity rates have doubled worldwide since 1980, while the global prevalence of type 2 diabetes in adults nearly doubled during the same period. WATCH THE SERIES FREE NOW! Finding and implementing recipes that defeat diabesity will also reduce your risk of developing these medical conditions. But before we discuss recipes that work to defeat diabesity, we should discuss what recipes do NOT work. Recipes that don’t work to defeat diabesity is just about every piece of “dieting” and weight-loss advice “experts” have ever given you. Can you guess what these recipes are? That’s right. “Eat less and exercise more.” This advice has seldom worked for anyone anywhere. Why? Because it assumes all calories are the same and that you can force your body to lose weight by starving it. Despite the fact that research shows 29 out of every 30 people who try starvation diets and conventional exercise ends up worse off, “experts” still teach starvation dieting as an answer to diabesity. Nothing…NOTHING…could be further from the truth. Any organism faced with starvation will fight back with a craving for food and a slowing of its metabolism. This isn’t theoretical. It is biological, and it applies to every living creature on the planet. This makes sticking to a starvation diet torturous to endure and sustain long-term. Oh, you will lose weight on a starvation diet. But you will be miserable the entire time, and once you go off the diet, you will likely gain every pound back plus a few more! This is called yo-yo dieting, and it is very common with starvation dieters. Statistics show more than 90% of dieters gain the weight back within 2-3 years. Most of these people, who probably blame themselves for their failure to keep the weight off, go on another diet. And the cycle repeats, with feelings that often includes frustration, shame, guilt, depression. And none of it was necessary. They like you are not to blame for any of these diet failures. They’ve been following incorrect recipes for defeating diabesity. Once they learn correct recipes, they will be able to effortlessly lose weight — and keep it off. Your brain, digestive system, and hormones all work together through a highly coordinated system to help stabilize your body weight and blood sugar—the same way they automatically stabilize your body temperature and blood pressure. They talk to one another through various feedback loops to synchronize the activities that automatically maintain body fat and blood sugar at a specific level (your setpoint). Think of the biological feedback system that establishes your setpoint like the thermostat in your house. Thanks to the thermostat, your heating or air-conditioning system respond to the weather outside and keep your home at whatever temperature the thermostat “thinks” it should be at. Similarly, your setpoint stimulates or suppresses your appetite and raises or lowers metabolism—your body’s food-to-fuel process—in response how much fat it “thinks” you should store. Contrary to the calorie-deficit theory of weight loss, that says if you deny your body X number of calories it needs, you will lose X number of pounds per week/month, the metabolic thermostat tries to keep you at your setpoint weight. The minute you start cutting calories, your body’s metabolic alarm goes off (just like a thermostat responds when outside temperatures nose-dive to freezing). It signals your body that you are not consuming as much as you normally do. In response, your body demands more food and starts burning fewer calories. Appetite goes up, calorie burn goes down. The only way to lose weight long term is to lower your setpoint weight. There are many recipes to do that. first, let’s discuss the reasons for an elevated setpoint weight. There are many things that elevate setpoint weight. Hormonal changes, exposure to toxic chemicals, leading a sedentary lifestyle. But the biggest factors in an elevated setpoint weight are poor-quality diet, chronic stress, and sleep deprivation. 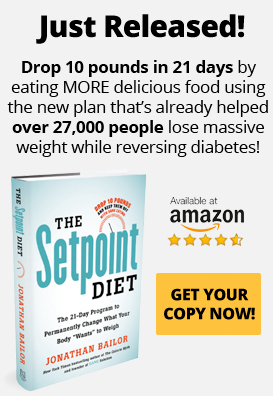 Poor-Quality Diet: Research shows over consumption of refined carbs, highly processed foods, and sugar elevates setpoint weight and leads to diabesity. Chronic Stress: Many studies show chronic stress causes weight gain. One reason for this is that stress triggers a release of cortisol which then triggers a release of insulin. Both of these hormones elevate setpoint weight. Sleep Deprivation: Not getting enough sleep every night is also a key factor in an elevated setpoint weight. This is also due in large part to cortisol. Studies show sleep deprivation triggers a release of cortisol that not only leads to an accumulation of belly fat but also increased hunger and cravings for refined carbs. Dietary recipes to defeat diabesity are easy and fun. You just need to remember a few principles. Eat more whole foods. Select foods as close to their natural states as possible. Choose vegetables you could have picked yourself (fresh, frozen, or even canned as long as they are not heavily processed), and meats you could have hunted. You’ll find whole foods on the perimeter of the grocery store. Eat more fiber in the form of non-starchy vegetables: Fiber slows digestion, regulates blood sugar levels, and lowers your setpoint weight. Fiber is best enjoyed in non-starchy vegetables rather than whole grains. Starchy carbs such as grains — even whole grains — cause surges in your blood sugar levels. Plus, they are not nearly as nutritious as their non-starchy veggie counterparts. You can also get your fiber from low-fructose fruits, but they contain much more sugar than non-starchy veggies. Eat foods high in water, fiber, and protein. Foods high in these 3 nutrients have no effect on blood sugar levels, and they lower your setpoint weight. The SANE Diet encompasses all these principles. You’ll enjoy delicious real foods that heal your hormones, trigger fat-burning hormones, lower your setpoint weight, and defeat diabesity. SANE is also simplicity itself. Who wants to go inSANE trying to remember a bunch of complicated foods and menus? With SANE, you simply select foods from the following 3 food groups at every main meal. If you do this consistently, you’ll be too full of SANE foods to indulge in any inSANE ones! Non-Starchy Vegetables: 10+ servings per day. Fill half your plate with non-starchy veggies, or blend 3-4 servings into a delicious green smoothie at each meal. Nutrient-Dense Protein: 3-5 servings per day, 30-55 grams per meal. Fill a third of your plate with nutrient-dense protein. If it’s a piece of meat, a serving fits inside the palm of your hand, but don’t worry about measuring it exactly. Whole-Food Fats: 3-6 servings per day. Fill the remainder of your plate with whole-food fats. You can also enjoy 0-3 servings of low-fructose fruits per day. SANE foods and meals are not boring or tasteless. Here are 5 excellent SANE recipes your entire family will love! With only 4 ingredients, eggs parmesan is an easy breakfast to prepare for your family. It contains 1 serving of protein and 1 serving of whole-food fats. Just add non-starchy veggies — perhaps a green smoothie — and you’ve got a complete SANE breakfast! With only 6 ingredients and 10 minutes prep/cook time, these deliciously crisp sesame fish fillets are the way to go. This recipe contains 1 serving of protein and 1 serving of whole-food fats. Add 3 servings of non-starchy vegetables for a complete SANE meal. If you love mashed potatoes but not the inSANEity of their starch content, you’ll want to try this cauliflower cream mashed potatoes recipe. There are only 4 ingredients in this recipe, and it takes only 20 minutes to prepare. Since they contain 1 serving each of non-starchy vegetables and whole-food fats, be sure to enjoy them with a main course of nutrient-dense protein, such as salmon. This comforting cabbage soup is SO delicious, and it takes only 4 ingredients and 40 minutes of your time to prepare. Serve it with 2 more servings of non-starchy vegetables and a serving each of nutrient-dense protein and whole-food fats to make a complete SANE meal. If you’ve been wondering if you can enjoy “decadent” desserts with SANE…yes, you can. These chocolate peppermint cupcakes are completely SANE. With ingredients like yummy coconut milk, almond flour, and SANE Cocoa Powder, you can’t go wrong! Be sure to join Jonathan Bailor and Chef Dawn Ludwig on episode 7 of the Diabesity Docu-Series, as Chef Dawn shows how easy it is to whip up SANE recipes to defeat diabesity. Anything that you enjoy doing will reduce stress. Many people don’t take the time to participate in enjoyable activities. To defeat diabesity, it is necessary that you do take time to de-stress. Here are some easy recipes to reduce stress. Go for a leisurely walk. Play catch with your dog. Go out to dinner with friends. Go for a change of scenery, either by taking regular day trips or week-long vacations. People have such busy lives these days that they often sacrifice sleep. That’s a big mistake because sleep deprivation significantly increases the risk of diabesity. To defeat diabesity, you should get 7-8 hours of uninterrupted sleep per night. Here are a few proven recipes to help you do that. Go to bed at the same time at night and arise at the same time every morning. Staying on a sleep schedule ensures an adequate amount of sleep. Put away your devices one hour before bedtime. The blue light emitted from the screens of smartphones, iPads, tablets, and other devices interfere with the production of melatonin, the sleep hormone. Keep your bedroom cool. Studies show people sleep best in a cool environment, not too hot or warm. Don’t eat or drink anything 3 hours before bedtime. Digesting food can interfere with your sleep cycle. And drinking anything too close to bedtime often results in disrupted sleep, as you may have to get up to go to the bathroom several times. Darken your bedroom. Any light in your bedroom can interfere with the production of melatonin, even the light from your digital alarm clock! If you cannot totally darken the room, wear a sleep mask. Don’t perform intense exercises 3 hours before bedtime. Intense exercise triggers a release of cortisol that makes you alert and “keyed up,” not something you want right before bedtime. If you must exercise, try gentle and soothing yoga. With these recipes, and you won’t have to worry about diabesity. Try them and see for yourself.